They test us, assess us, guide us, inspire us and humor us. They show us the path in life and tell us right from wrong. They amaze us with their unrelenting patience and ability to motivate. Thus becoming the true multitasking superheroes! The Guide – Guiding students all the way from Nursery, where they cry and bawl, to their college days, when they can stand up and have intellectual debates. The Mentor – Inspire, encourage and praise. Their only target is to make their students future superheroes. The Second Parent – A parent’s peace of mind is a teacher’s peace of mind. All those hours spent in school from scolding us to treating us with food on tough exam days. They are there for it all. The Friend – From giving us a shoulder to cry on, reassuring us that exams are not the be-and-end all to advising us to get a haircut because it’s too out of place, they have all the solutions. The Role Model – They may not be Batman, Captain America, Shaktiman or Kalpana Chawla but they are awesome enough sometimes to make us wonder how they do it. The Actors with big hearts – Good teachers are great performers with big hearts. They have the answers and ideas to solve a problem in the best possible ways. The teachers at BYJU’S too are some of the most amazing people in the realm of teaching. Keep an eye out for our next segment where we give you a peek into the lives of some of your favorite BYJU’S teachers. Hi anand srinivas is my most fravourite teacher..Wishing alll a very happy teachers day..
Aanand sir is the one who made physics so interesting.I really want to thank him.I would like to meet him face to face at least once.Thanks Byjus app for giving an opportunity to learn with a teacher like him. Divya ma’am is my favourite teacher as she makes the topic very interesting ,which makes it easy to understand, by the ways he speaks and explains. I thanks each and every teacher of BYJU’S for making me love with learning . But my special thanks goes to Anand Srinivas sir. According to me he is the world’s best teacher. He speaks little faster then other teachers but each and every word of his sentence is simple and easy to understand and sometimes express a lot . I can even study 24 hours if he teaches me. Anand sir, happy teachers day in advance. But really I found guidance, friendship, discipline and love, everything, in one person. Byju sir is marvellous,the effort he takes to explain the concept is great,it gets registered in your grey matter,Anita mam also explains in a very cool manner, happy teacher’s day to all byjus teachers,Anand sir,I love you so much,Divya mam you are really sweet,vinay sir is a serious teacher but really good explanation. Happy Teacher’s Day to every rocking, fantabulous,jhakaas,Bindaas teacher at Byju’s! Aanand sir,Divya ma’am and Vinay sir- Hats off to you all,’cause you all are unique teachers and first and first most,my inspiration. Just love the way you all teach👌👍. My favourite teachers are all of them and i wish them all a very happy teacher day but if I am to choose one than it will only be anand sir he is like my idol he is best teacher i have ever studied with. All teachers in Byjus are my favourite teachers. I had purchased Byjus premium course for 10 class. The classes are just amazing. They are easy to understand. Especially I like Aanand sir class. Good thought to create Byjus app. Thank you. Wish all of teachers “A HAPPY TEACHERS DAY”. I simply love all the teachers! They are just amazing!! P.S. School would have been a lot more interesting if we had teachers as hot as Mr. Aanand Srinivas. Happy teachers day in advance to all the lovely teachers. My personal favorite teachers are Anand Sir and Anita Mam. Not only their style of speaking builds the suspense, the way they deliver the lectures makes it way more interesting.I see the real qualities of a “teacher”in them. All teachers r my favourite but i like bio mam and chemistry d physics sir very much. He is really amazing i dont have words for him. All are my favorite teachers. There teaching is something that I would never forget. I would be nothing without my teachers. Happy teachers day to all . All of the teachers are best and so it is very difficult to choose one of them . But if i want to do I’ll go with Anand and raveendran sir . Anand sir and Divya ma’am are my personal favourites as teachers and not to mention the ones that teach us in the classes thanks a lot!!!! ‘A good teacher is like a candle, it consumes itself to light the way for the students! !’ Hi dear all the most respected,loved and appreciated teachers I can’t compare any teacher they all have their own values but I’d like to write that my most favourite teachers are RAVINDRA SIR, AANAND SIR AND DIVYA MA’AM.But a very honest HAPPY TEACHER’S DAY to all the teachers. Teachers are like candle who burnt themselves to show us the lighted path of success. With this a very happy teacher’s day to all the teachers. My favourite teachers are AANAND SRINIVAS sir and ARJUN MOHAN sir who teaches physics and maths in a way that is very noticeable one. Aanand sir is the best teacher who changed the way I was learning the beautiful subject physics before. To be very frank..Aanand sir is the best of teachers at Byjus. All of u are my favourite. You instill confidence in me and make learning interesting than ever. Happy teacher’s day to all these great teachers… I love them all…. Their way of teaching is just awesome!!!! All of them are equally awesome ! Believe is what I have in my teachers. At this juncture I really feel to bow and respect the art of teachers who turn their lucrative opportunity to life long achievement of students. I especially want to thank divya ma’am , i am flattered over her teaching skills. Divya mam. I just want you to know that you are the best teacher.You simply stand among the rest.I feel so blessed to have an amazing teacher like you in my life. They create the mood for me to study, When I didn’t like to study on my hectic schedule of school days..! My favorite teacher is raveendran sir and including my mentor because of them I am able to improve my math and science so, happy teacher’s day to all them. My favourite ones are Aanand sir and Arjun sir..
Aanand sir teaches every concept by linking it to some or the other interesting thing with awesome examples, making the concept a piece of cake..! And needless to say, Arjun sir is the best maths teacher ever!! I thank all the teachers at byjus for making me fall in love with learning!! My favorite teacher is raveendran sir and including my mentor because of them I am able to improve my math and science so, happy teacher’s day to all of them. All the teachers are amazing. They make learning iinteresting.We never never get bored while learning from Byju’s. I wish the vedios of this app were shown in the classroom on the smart-board, so that we enjoy learning at school. My favourite teacher is Aanand sir. He makes learning physics really interesting. He concepts he teach are very clear. He doesn’t leave any space for doubts. His sense of humour makes us fall in love with the teacher. Thankyou Sir for teaching us so beautifully. I like all of them . All are great teachers but if I had to pick one it would obviously be Aanand Sir . He makes learning very cool and fun . He is type of an idol for me and I love learning from him. I like all the teachers of Byju’s. But if I have to select the favourite then I cannot select all of them. So I select Aanand sir,who teaches physics in such a way that it becomes the easiest subject for me.. Here all the teachers are best in their own way from converting either hard formulates,derivation or any theory, they make the most hard forms to the most simplest way n always gives us the best explanation that we could remember…….. Here my favorite teacher is Aanand srinivas sir who makes physics concept so easy to understand. Wishing him and all the BYJUS team’s teachers A VERY HAPPY TEACHERS DAY.. I wish a very very happy teacher’s day or happy parents day .I love all of my teacher .Thanks a lot for your sacrifices and the teachers like divya ma’am ,anand sir ,byju sir ,Anita ma’am are among the top list of my favourite teachers . And Divya ma’am is the most most most favourite teacher of my mine. OMG!!! I’m so happy today that I finally know my favorite teacher’s name. Anand sir, I’m in love with your classes. I use to hate math and physics (I still hate maths) but from the very first class I attended in Byjus, I started liking it. The way you teach made me want to know more. The way you ask questions and give us examples to get the answer ourselves, makes me so curious about everything. When I first saw my physics book I was like, arrrr… Why in the world do I have to go through this torture?But now I’m like, ok let’s try this one. Now I don’t give up on my questions easily. I try to solve it multiple times. I don’t know from where so much patience came into me or maybe I’ll say it’s interest. Yes interest is the word not patience. If you can make me like physics then you can do anything. You’re like Thor, my lightening hero, always talking about atoms,electrons, protons and stuff( can never forget those experiments). Trust me, I’m very happy to know your name. I don’t go to tutions so the only place I get to talk to my friends is my college. But when they start taking about their tution teachers I feel left out, because everyone time they ask me- so who’s your favorite teacher? I just look down and reply dryly that I don’t know and they look at me like I’m an alien or something ( I can’t even blame them, I mean he’s teaching me for almost two years and I don’t even know his name. Such a shame) and the worst part is when they start mimicking their teachers ( hell!! My teachers only talk about studies, no!!! they never asked my name. They never make jokes. And yes!!! They never scold me! Ever!!! Sometimes I miss getting scolded) but poor me, I can’t do that, because I know nothing about my teacher’s behavior to mimic them. But now I atleast have your name. I’m a very talkative person and I can talk hours and hours with out any break but to keep it short (sorry about my dramatic feelings) thanks a lot for making me my student life a lot better. I would wish all the teachers a Happy teacher’s day. But personally I would like to thank Byju and Aanand sir and Divya mam too. They are not teachers, they are like my friends. #thebestteacherintheworld!!!! And I’m sorry I almost forgot to wish you, happy teacher’s day 🎂🍬🌌🎆🎇🎉🎊😁 Anand sir. Who’s my favourite teacher?It doesn’t take the slightest of time to decide that. That’s undoubtedly Mr. Aanand Srinivas (The physics God)…Without even his actual presence, he effortlessly manages to connect with me (and obviously other students…I’m sure of that)…he has an intriguing way of explaining and breaking down concepts….We also share a fascination of space and the universe….If I get the right opportunity, I’d like to meet you one day, converse a bit, and talk about all the paradoxes, actual facts and conspiracies related to space(wormholes, distortions in the space time continuum, event horizon- black holes, dark matter, antimatter and the god partical)! I’m a true fan! My favorite teacher at Byju’s is SIDDHESH JOGLEKAR SIR ! He is a brilliant teacher with cool attitude ! I love the way he raise my curiosity level when I end one video and go for next video inculcate the desire to watch next video. I love the way he explained a lot of concepts by use of experiments be it viscosity or effect of catalyst. The way we used 3D visuals in ‘Solid State’ is great no one can explain solid state better than him. He is great ! And yes he is a trick master 🙂 he provided a lot of tricks to remember tricky data like the trip to remember electrochemical series. I was just rolling on the floor when he sing ‘Chod Aaye Hum Wo Galiyan’ for explaining Frenkel defect I have fallen in love his singing. No teacher explained any concept ever in senior secondary classes by singing, never ever . I loved his ‘recap’ strategy in which he summarises all the points which he has explained in a particular video. He completely changed my perspective of looking at physical chemistry I used to think that Physical Chemistry is just remembering of formulas and applying it to solve problems but no he completely opened and explained each and every part and then integrated it in such a way that I find physical chemistry extremely easy now ! Such teachers are extremely rare ! Thank you Byju’s for bringing him. I wanna meet and talk with SIDDHESH Sir ! All the teachers of this app, seen by me only through the visuals, are simply awesome..They have played a major role in helping me reach my academic goals and have also inspired me a lot..Wishing all these wonderful superheroes a very happy teachers day and may you all have great success in this field..Continue inspiring me as well as those learning from you all around the globe..I wish I could meet all of you one day in my life..
My favorite is Anand sir…… Because he is the real hero of physics…. I love physics but I didn’t get the good teacher like Anand sir…… So they strengthen my love towards physics…. A very happy teachers day to all my teachers☺ I whole heartedly thanks himanshu sir for making my journey so easy in physics.sir i love your teaching style.Thank you. We can’t tell any teacher good or bad because every teacher is best in teaching his/her sujbect.In my point of view that teacher is the best who should teach in such a manner that I can understand it well.Ok leave aside all the things !Happy teachers day to all! My favourite is Anand Srinivas sir. I like his unique way of explaining concepts which are easily understood. All of them are my favourite teachers and I wish them all a very Happy teachers day.I wanna thank Anand sir,who has made evey tough concept easier, his way of teaching is so motivational ,he is like my ideal.Thank you sir. Bcoz of him I met other wonderful and best teacher’s. My favourite teacher is Aanand Srinivas sir. The way he teaches physics and makes otherwise boring concepts fun and interesting is the best thing about him. He way of teaching helps me grasp information much faster. Even though I loved Physics even before BYJU’s classes I actually had to sit a for a long time. But now with such an amazing teacher I am through whole chapter in just a few hours. Thank you so much sir. Happy teachers day to all the teachers. All of them are good and teach the subjects in a proper understanding manner. So I like all the teachers. I love Anand Sir’s videos. There is something very special with him. He entertains us and we automatically learns the subject. You increased my liking to physics.This is all I expect from a teacher, a teacher who teaches subject not in a exam view but in a thought that he must get the subject and the concept.Thank you sir. My favourite teachers are Anand Srinivas sir and Byju Ravendraan sir . Anand sir teaches physics in a fascinating manner. He makes you understand the concept very precisile and in a logical manner . Byju sir makes you understand the topics very easily and also to solve a question in the easiest way. Happy Teacher’s Day to all the BYJU’S teachers, I like all the teachers, but the most is MR Aanand sir. I can understand his teaching easily. Anand srinivas sir is my best ever teacher in byju. I like the lectures of all the teachers in Byjus videos…the hard work of the entire Byjus team is commendable…really it’s always interesting to learn with 3D live videos. There’s only one drawback of the one on one interaction between them and me. I love all the teachers but the one who is my favourite is Aanand sir. He is just too good. His videos are just amazing and he has nice humour in him……. God has gifted me byjus to learn everything very well … I would love to thank the whole byjus team because without all of them it is not at all possible….Thanks a lot..Great byjus team. First of all a very happy teacher’s day to all the wonderful teachers here at Byju’s. Talking about my favourite teacher, all the teachers are my favourite and this is because other than my school teachers, you guys were the one to help and guide me, the entire year. You all are like superheroes who could never really see me but still do all this for me. You are like celebrities whom I wish I could meet once and thank them for being a part of my life. I have really fallen in love with those subjects which everybody in my class hates and I want to give the credit to such awesome teachers hhere at Byju’s. And again a very very happy teacher’s day!! I love all of them,and I agree that they teach us in a different way that we enjoy to see as well as to understand.My favorite teachers are DIVYA mam,ANITA mam and ANAND sir.They are my favorite teachers that I have ever seen in my life. My favorite teachers are all of them. They all are super cool! My favourite teacher is sir Aanand Srinivas.The way he teaches physics is very rocking and fantastic. Though my favourite subject is not physics(it’s chemistry) but sir you make this subject very easy for me. And happy teachers day to all of the rockstar teachers of Byju’s. Because it is you all who helped me to score good in my 10th CBSE board exam. My favourite teacher is Anand sir. Thank you so much sir for making physics very easy for me . Your lectures had always guided me in the time of need and provided me knowledge with lots of fun …In short you are most amazing, fascinating ,cool and the best physics teacher in the universe. Rest of the teachers are also good and you all too made my studies easier. Happy teachers day ! All teachers are best for me and i wish them all”happy teachers day”. My favourite teacher is Aanand Srinivas Sir. He’s the best!!!! His way of teaching is unique and awesome. I wish the a very Happy Teachers Day! Himanshu Sir is best Physics teacher. Siddhesh Joglekar Sir is best Chemistry teacher. Vinay MR Sir is best Biology teacher. I want to thank all the Teachers of byju’s. They had really helped me a lot and taught me how learning can be a fun. I also want to thank my mentor Varsha ma’am for guiding me the best. Happy teacher’s day to all the teacher of byju team..if I have chosee one it’s definitely Ananda sir….the way he explains is so pleasing that these topics or soo fresh in our minds and every time I answer any quesions from his topic it always correct ..he ha a unique ability to make even the difficult topic as easy as possible..thank u sir .. I was never confused during his explanation.he will move to the next concept of the chapter after making everything easy to us ,but I like every teacher of byjus but if someone ask who is best ,I will not wait to tell his name. My fourate teacher of byjus is Aanand sriniwas. And I wish every teacher of byjus happy teachers day . And thank every teacher for making learning easier. Just love the way you teach.. Yes happy teachers day to all the teachers of byjus they have made us understand all concept in interesting way all are my favourite. And my most fav is divya mam and an and sir who made bio and phy interesting for me respectively. Ty you all and happy teachers day. I’m writing for Aanand sir..Hello sir, I’m NEET aspirant,this is my 4th year of preparation..I wasn’t able to get physics so far but this year when I started learning from you,I was amazed..How easy it is to learn physics… Thank you a lot sir..I can’t express my love for you… Loads of love sir.. Happppyyyyyyy teacher’s day !! My favourite teacher is Anita mam,she teach math basics with clear examples and i thank my mentor Sowmya mam for guidance she made. Aanandh sir is my favourite teacher,he is amazing in teaching physics!!!! I love all teachers. Every teacher has its own style of teaching and they are brilliant in there subjects. Aanand srinivas you are my favourite. Your teaching method is very nice. You made complex concepts easy. Favourite lecture was on metals and non metals ,activity series . One of my favourite teachers is Mr Anand Srinivas.Since the day I have started learning physics the subject has become easier.The way he teaches is really very good.So here I whole heartedly thank my sir. All the teachers are nice. They help us to build our concepts strong. I found every lecture helpful. But the most interesting teacher found in these lecturer is Mr. Aanand Srinivas(cool guy). All the teachers are nice. They help us to build our concepts strong. I found every lecture helpful. But the most interesting teacher I found in these lecturer is Mr. Aanand Srinivas(cool guy). My favorite teacher is Aanand sir and Divya mam they are the best teachers I had studied with. I wish them a very happy teachers day😆👌 you both are the best!!! My favourite sir is Anand sir ( physics teacher ) he is just a awesome teacher . Wishing you a very happy teachers day .. And also my favourite maam is Divya maam ( biology teacher ) wishing you a very happy teachers day . I used to hate physics and never understand it. I have never felt like learning physics. Its just the amazing way Anand sir teaches that inspires and motivates me to learn physics. He is the most amazing teacher ever. Each and every teacher are fabulous in their fields.But Anand sir is extraordinary he is different he is the best teacher I have experience.Wish you happy teachers day.Keep teaching and giving knowledge to students like us.Thank you and Happy Teachers Day. I like all the teachers who teach me whole heartedly…. It’s great studying with all of you’ll…..it’s easy to understand and I would always wish to continue studying with you’ll….I’ve got the best teachers. All teachers are good, but for me Anand Srinivas is the best, hands down! The way he teaches Physics is phenomenal! I would like to wish every teacher a very HAPPY TEACHERS DAY and specially to Aanand Srinivas sir who is the best physics teacher who had ever taught me. Greetings to all the teachers of BYJU’S on this teachers day. Initially I used BYJU just for my revisions for NEET. But now I am using it as my learning companion for this year. I liked the teaching methodology of BYJU’S TEACHERS. Their teaching makes everything come alive. Learning through BYJU’S has made me more eager to learn. Every teacher here is great. But I liked the BIO lessons of DIVYA GOKULNATH MA’AM AND PHYSICS BY AANAD SRINIVAS SIR . THEY BOTH ARE EXCELLENT IN THERE TEACHING AND IN explaining everything. Divya ma’am and Aanand sir are my favorite teachers! You both are the best teachers I have ever studied from in my life. You make learning easier and more interesting. Thank you Byju’s for bringing them. She is one of the best teachers I have ever been taught by . The way she explain things is just amazing… 🙂 . Whether it’s biology or maths her stories always remain interesting and sarcastic 😙 . Her way of explaining concepts in the form of stories is outstanding. For eg that biology chapter’TISSUES’ is such a confusing one but when I saw the video at BYJU’S then I knew that it was just so easy and this is only because of her …. After that day whenever I saw that she was going to explain the concepts I was most interested in learning the topic even it was not of my syllabus or interest as I knew she will definitely make it interesting..🙂🙂. I love her way of teaching..😍 . So this teachers day I would like to wish and thank all the teachers at BYJU’S and especially Divya mam for being so good at their jobs.. 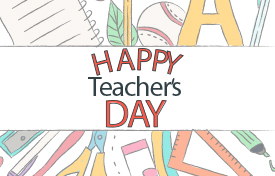 I wish all the byju’s teachers a very very happy teacher day!!! They helped me to understand all those concepts now I understand the fact that “Learn for exams, learn for life”. HAPPY TEACHER’S DAY TO ALL THE AMAZING TEACHER IN THIS PROGRAM WHO MAKE TIME TO HELP US LEARN. THANK YOU SOO MUCH FOR EVERYTHING YOU ALL DO FROM TELLING THE RIGHT PRONUNCIATION TO GIVING US TRICKS AND TRICKS TO STUDY EASILY. ALL TEACHERS ARE AMAZING AND I LOVE LEARN WITH THEM!!! She makes complex topics of bio really interesting . My favorite teacher at Byju’s is Sujata ma’am…she is the best teacher of maths I have ever met…..because of her spirit and way of looking at maths…I ended up loving maths than any other subject and it is the subject I enjoy the most despite of me being in 10th class. I loved her the most…she is not here in our branch right now…but I miss her….I miss her soooooo much….I am waiting desperately for her and want her back here…please can anyone ask her to come back…I am Nishita from Byju’s Banaswadi, Bangalore… Love u ma’am…….. Come back…I need u…. Himanshu sir is the best teacher. First I would like to thank all the Rockstar teachers of my favorite Byjus app and I also wish all the teachers of Byjus a happy teachers day. Life is like a mysterious journey… and your words always guiding light throughout..
Physics- something that i hate the most.. But Aanand Sir you are the best… You really taught me how love such a hatred subject… Noone can do this other than you..
You all are the evergreen superheroes of my life… Wishing u all the happiest teacher’s day..
Will always be thankful for all the hard work you have put in to educate us… Thanks a lot..
All the teachers of this app are my favourite..Wishing them all a very happy teachers day..May God bless them all..
All the teachers are my favourite and they do the best to make me understand the chapter and the concepts. I wish all the teachers a very Happy Teachers Day. ANAND Sir who teach us with full enthusiasm. Once again Happy Teachers Day. Divya Gokulnath is my fav teacher.she teaches amazing and clear every concepts and doubts.And I want to thank all byjus teachers because they all are so good and teach in a so easy and wonderful way. My Favorite Teacher is Aanand Srinivas…and I wish every teacher a happy teachers Day!!! I thanks to all the teachers of by’jus , and my special thanks to vinay sir who is my most favourite teacher. I really want to thank Divya ma’am, Vinay sir, Anand sir, Avinash sir, Abhishek sir and Siddesh sir for really helping me in the respective subjects. I can happily say that I because of BYJUs I got a MBBS seat in Mahatma Gandhi medical college, Pondicherry . Thank you for guiding me. My favorite teacher is An and sir. He teaches physics and chemistry very well. Even Divya ma’am is a good biology teacher. My favourite teacher is Anand sir and Divya Ma’am.They help me in understanding concepts such as biology, chemistry and physics. I have developed interest in mathematics just because of Divya Teacher. Thank you Teacher. You made it so simple. My favourite teacher is diya mam because use teach us in an interesting manner. She allways narrates a story and tell us about difficult consepts. I her a lot . One of my favourite teacher is Divya Golkulnath ma’am. She is a fascinating teacher. She makes all the concepts of math very interesting. Thanks ma’am. I am very grateful to you. I like all the teachers very much. I gained a lot because of the byju tab and personal coaching. I want to thank Anand sir who made physics very easy and in my classroom session I like Arjun sir very much I like to thank Raveendar sir for facilitating all this and make all the students dream come true. Happy teachers day to all of them. I promise that I will be a good student. Should appreciate Aanand Srinivas sir that he didn’t take any practice sessions and has got a lot of perfection in his teaching. Aanand sir, I am a big fan of you and want to meet you atleast once and discuss a lot of things about physics. I also like your jokes about your experiences. I’m also thankful to you in bringing the curiosity about physics in me. ‘ history of gravitation’ is a very inspiring video for me and I think all should watch that video. You are the best physics teacher and happy teachers day….belated wishes….as I saw the comments today itself. He is a good teacher. He teaches so well.He never let doubts staying with us.He is perfect . I love all the teachers of Byjus. A very happy teachers day to all the teachers. Ever since in my secondary school, I hardly understood something. I was really agonised and ponderous on what will happen. It was a nightmare and at times I used to burst in tears…by hearting was an option, but that was not my cup of tea.somehow I cleared class 6 exams with a good grade. I always felt what if learning became that much more awesome.. Then byjus and many other tuitions struck me. I went along byjus just as a guinea pig..! I frankly did it just for experiment. I was awestruck with the way the videos have been structured. Everything felt just fine and I began to do something that changed me.. I began to feel these videos (rather movie clips) were just the way how I wanted to learn and not something that I used to do, mugging up. The way the mentors in the app taught me opened a can of wonder and completely changed the way I thought of maths and science. Divya ma’am really likes teaching. She immerses herself in the colourful world of biology and all her teaching is great. Anita mam is also very good and just like byju sir, she is to the point (I like it) and her explanation is very practical. Anand sir, great ! I really love the way you teach. You have ignited my curiosity in so many ways and I believe in what you want to say Good answer is much more less important than good questions!! Hats off! At last, I feel every mentor has moulded me into a person who is in love with math and science and changed the way I think.. I like all the mentors. They are great!!! My best teacher for mathematics is Byju Raveendran. Happy teachers day to you sir. I am very fond of you. My favorite teacher is Aanand air. His teaching of physics made it more interesting for me. I would like to thank all byju’s sirs and madam for giving best teaching to students I am one of them because of them we get to know clarity of the concept and we can learn happily. .And I like their way of teaching.Not only that when one video of the concept is over then I am so excited to watch the next video.Wish you all happy teachers day to all sirs and madam in advance. These three are the best teachers according to me as they are really rockstars . My favourite teachers are Divya gokulnath,Anita kishore and Anand Srinivas. All of them are persons who enjoy teaching and encourages and brings out our energy and interest for or into learning. I like the way of pronouncing words in Divya miss and her different, interesting stories. Anita miss explains everything so elaborately. And so many times I have noticed that whenever I get some doubt, the next moment I see her actually explaining about the same doubt. That is why I oftenly think that how she is able to know what doubts we may get. And Anand sir is one of my most favourite teacher. I found that I have got a lot more interest in Physics and Chemistry because of the detailed study. I think that Anand sir is so active person which I like more in him. His active explanation does not let me get sleep while learning which I oftenly get during my study hours in my house. And I oftenly think about the hardness of teaching in this form because it is not so easy to visualise something and teaching it when there is actually nothing in front of them. So, thank you for every teachers and Mr.Byju sir for inventing this valuable app. I love her,she is really amazing and clear in explanations, her excellent ways of using visual component is wonderful.I think she know where I got confused so! My favourite is Anand sir . His way of teaching is fascinating and the constant use of word fascinating is actually fascinating. All teachers are very good. They teach very well. If I’m to choose 1 I feel that Byju sir is the best…..
My favourite teacher is aanand sir. He makes every concept easy and simple. Also arjun sir makes every topic of math interesting. amazing teacher all of them…happy teachers day to all of you. absolutely fascinating people! I’m blessed to be a student at Byjus. I’m extremely thankful to Sir Aanand Srinivas for making physics so interesting for me. I used to hate physics but with his guidance I have fallen in love with. I would also like to thank all the teachers at Byjus for making me fall in love with learning. I wish a very Happy Teacher’s Day to all the teachers. Divya mam is my favourite teacher, I love the way she teach biology. The way she taught replication of DNA was fantastic. I can definitely say that she is a wonderful teacher and I feel really fortunate that iam a student of such a wonderful teacher. You are the best mam. My favorite teacher at byjus learning app are :ANAND SRINIVAS SIR and BYJU RAVEENDRAN SIR. ANAND sir’s way of presentation is very very interesting and good.It helps me to learn things easier. I would like to thank each and every teacher of byjus app..
Now thanks to all teachers for enlightening our paths….guiding us….teaching us …😘😘😘.. I want to dedicate 4 lines to u all the treacghers..
Taalim or shiksha ki jannat apko salaam..
Aap sabhi WO ilam-o-hunar ka muqam hai..
All are the best Teachers. I like every teacher. Especially Anand sir and Raghavan sir. I luv chemistry. So I have become a fan of Raghavan sir. I like everyone. Thank u so much. You are all our role models. Thank u once again. my fav teacher is anand srinivas sir and divya gokulnath maam. All the teachers in byju’s team are very respective and loving.but my favorite teachers are both aanand and aswin sir.i want to thanks byju sir for starting such a great learning app. Rajesh sodhi, you should revisit the chapter solid state bcs chod aaye hum wo lattice point is for schottky defect and not for frenkel defect. Divya mam and Aanand sir are the best teachers. Other than helping me with the math and science ; as I have the love for literature ,they both inspire me so much and fill my mind with such wild imaginations that I can write poems and stories.I’m 14 i Have written many poems as well as stories and I’m looking forward to write a sci-fi novel and obviously a very big Thank you to both of you teachers for getting my imagination running wild. Thank you so much for your time,help,love, support, and encouragement. Happy teachers day to all.. I Feel blessed to have such amazing teachers..all of them are love but aanand sir and Arjun sir u r the best…..
My favourite teacher at Byju’s is Aanand Shrinivas sir. His teaching techniques are amazing. I’d Like To Wish All The Teachers A HAPPY TEACHER’S DAY!! HAPPY TEACHERZ DAY TO ALL TEACHERS. MY FAVOURITE TEACHER IN BYJUS APP IS AANAND SIR. I THANK YOU ALL FOR GIVING ME A STRONG FOUNDATION IN MY STUDIES. IT’S IT UNIQUE GUIDANCE AND METHODS THAT URGES ME TO STUDY ND SOLVE ANY DIFFICULT PROBLEMS WITH EASE. A SPECIAL THANKS TO AANAND SIR FOR MAKING MY STUDIES MORE ENTHUSIASTIC. I like and respect all of the teachers.Among them my favorite teacher is Sangeetha mam. She is the best maths teacher. I like her kindness and patience. Anand Srinivas sir and arjun mohan sir are great teachers…They teach in such a way that we will never forget it..
All the other teachers are also very good..
A very happy teachers day to all of them. ALL ARE MY FAVOURITE TEACHERS.I WOULD LIKE TO MEET THEM IF I WOULD GET A CHANCE.THIS BYJUS APP IS VERY USEFUL.I SAY MY THANKS FOR ORGANISING SUCH A USEFUL APP TO ALL MEMBERS. Happy Teachers day, to each and every teacher at Byju’s. You all just proved that being far far away from their students can change their lives. Since Teachers day is the occasion to thank teachers, I would like to specially mention Aanand Sir. Physics is now my favourite subject,sir. And thanks to all the other teachers too. You all are making a difference. Teachers are THE jewels.a famous quote to all of the teachers out there associated with byjus.”A teacher takes a mind , opens a mind and touches a heart.thank you all of you for your guidance and your time which you all have dedicated to nurture our future.continue to be inspiring so that we can rightly follow you footsteps.and thaaank you once again. Wishing you Happy Teachers Day to all teachers in the BYJU. And Special Wishes to my Mentor N.Nishanthini Ma’am. Happy teacher’s day.I wish to give thanks to every teacher for making our life so precious.Divya mam is my favourite teacher as she was very dedicated to every topic to make it very simple for us.again wish a happy teacher’s day to all the teachers for their love,dedication and for giving their precious time toward our destiny. My favourite teacher is Divya Gokulnath mam and Anand Srinivas sir. Thank you teachers for helping me to understand terms clearly. Learning like this is amazing . A very Happy Teachers day . I love to study from Anand Srinivas Sir and Divya Gokulnath Ma’am. Their teaching patterns have changed my life in just four months, and made me a chemistry lover. Thank you Sir and Ma’am for making me what I am today…. I like Raveendran sir, Aanand Srinivas sir Anita Kishore mam Divya Gokulnath mam these teachers helped me to understand topics easily and Happy Teachers Day!!! To the world you may be just a teacher . But to your students you are a hero …. Thank you Anand sir and Divya ma’am for all this wonderful support you have been giving us. Love you all loads. HAPPY TEACHER’S DAY!! Wishing all d teachers a Very Happy Teachers Day… Thank u Divya Ma’am for making Biology more Interesting than it was b4! Aanand sir , ur Teaching makes d Physics like Understanding to its deepest …. Thanks a Lott! Siddhesh Sir….. Thanks for ur Wonderful Chemistry!!!! All of the teachers are excellent at their subjects. And what do we need more if all our concepts are cleared. I wish a very HAPPY TEACHERS DAY to all the teachers. Thank you for your cheerful guidance that has always helped us prosper our minds.I will always be thankful of each and every teacher in byjus for their support and advice. Lastly I like all the teachers/mentors in byjus as all of them have their own interesting way to teach new concepts. A very happy teachers day to all the teachers of Byjus…. The best teacher I have ever seen is AANAND SRINIVAS sir. Actually my whole family is full of teachers but I hated te courrier of teaching and I never wanted to be. But the moment I took my first lecture from him I too explained the topics to my classmates in the same way he teaches. Since then my friends prefer taking guidance from me. I love the moment when they thank me for the clarification. But who knows the secret that I have the most amazing teacher in my own mobile. A very happy teachers day to you sir and the whole byjus team who has very well understood the problem of students and took the initiative to support us in a very great way. I would love to meet AANAND SRINIVAS SIR if I could for sure.😄😄☺☺ He is the most favourite teacher of mine. A very happy teachers day to you all. HAPPY TEACHERS DAY TO ALL THE TEACHERS!! Thanks to all the teachers for clearing the concept. Thank you sir and keep teaching just like this. A happy teachers day to all the teachers. All the teachers at Byju’s are great and best. But personally, my favourite teacher is Mr.An and Srinivas sir. He is the best teacher I have ever been taught by or will ever be taught by. Thank you Byju’s and all the teachers. ‘A teacher takes a hand; opens the heart & touches a heart.’ With this extremely dedicational quotation, I would like to thank all the teachers of the byju’s team. I have been experiencing byju’s for a pretty long time. But never derived a pessimistic thought about it. So keep encouraging; keep inspiring more and more jewels of the nation. It is the supreme art of teacher to awaken joy in creative expression and knowledge! Happy teachers day to all the teachers of Byjus!! I love DIVYA MA’AM and VINAY SIR. Through your guidance and the way you explain I feel that I am ready for all the challenges. Both of you threw away the fear of math that was in me . Hats off to all of you. Thanks a lot. Happy teachers’ day to all the teachers!!! Creativity, originality and imagination-the things u have cultivated in me aren’t measurable right now but I’m sure ur contribution in my life will be way more than just measurable. I will always be thankful to u for all the hard work and efforts u have put in for our betterment. My favourite teacher is Divya gokulnath ma’am. A very HAPPY TEACHERS DAY to all my amazing teachers of byjus classes. I can’t thank you by words ! You all are rocking stars !! Not only help us to understand our concepts easily but also inspire us, increase our curiosity to learn more and more. Every teacher is my favourite, but the mentor which is not only my role model but of millions students , Ravindra Byju sir. I’m a biology lover and big fan of Divya ma’am. Before byju came on my way I was hating mathematics literally and thanx to d Angeles who added colours to my boring mathematics, Anand sir and Anita Ma’am thnx fr making mathematics too interesting for me . Who changed millions into achiever !! I have been studying with byjus since April 2017 all the teachers are my favourite some of my most favorite teachers are aanand sir , himanshu sir, avinash Sir , Siddhesh sir, Vinay sir ( fun fact friday), ashwin sir and these all changed the way I study and learn there are 2 or 3 more teachers whose name I don’t know. Now as a feedback the teachers I don’t like are Byju Ravendran (quite ironical right) and Arjun Sir they seem to be like just saying and not explaing. Thankyou to all in the byjus team for making my concepts clearer and by changing the way I learn . Happy Teachers day to all respected teachers. Teacher is the person in our life who provides many important things together with the good education. They play extraordinary role in our lives from the beginning years of development. They mould us and our future accordingly in order to make us a responsible citizen of the country. All teachers of Bygus are extraordinary but my favourite teacher is Mr. Anand Srinivas. I Love the way he teaches. Happy teachers day to all special, superb,extraordinary and unique teachers at Byju’s. I would love to express my deep gratitude to every teacher beginning from Byju Raveendran sir, Anita mam, Divya ma’am , Anand sir and all others who taught me in the best way ever. It is always a great fun listening them all. They guide us…they support us…they inspire us…they teach us…today is the day to thank them and say HAPPY TEACHERS DAY!!! Aanand Srinivas sir is the best teacher. He made physics fun subject. The way he teaches is so cool. Biology from Divya ma’am gives you the feeling that you are listening any story, so much fun. Aanand Sir is a unique teacher 💜 happy teachers day to all the teachers there! HAPPY TEACHERS DAY TO ALL THE TEACHERS OF BYJUS. I took +1 physics course. I would like to thank Mr. Anand Srinivas who is the best of all the teachers in his subject. His ways and methods of teaching are really interesting and make me stick to the app till the end of the module. I am very much inspired by his teachings. I would like to call and thank him personally for his wonderful job. I would also like to thank BYJUS for introducing very excellent teachers. I believe this app brings national integrity by connecting teachers and students in and across the boundaries. Huge thanks to Divya ma’am for making Biology easier and also to Aanand sir for because of his brilliant teaching skills i have been able to get over my hatred of calculus.I would also like to thank all the other teachers too. You all teachers are awesome!! Your way of teaching! I’m able to imagine each and everything which was impossible for me.You had developed my interest in each and every subject.My favourite teacher is AANAND SIR….His way of teaching physics is really nice. My interest had automatically developed in physics. All the TEACHERS of Byju’s are enjoying teaching us. My Mentor, Ashrin Sir is also very supportive. Aanand Srinivas Sir and Anita Kishore Ma’am are two of my favourite Byju’s teachers. Happy teachers’ day to all the teachers of Byjus classes. Arjun Mohan sir and Anand Srinivas sir are my best teachers. Because of thier effort I started loving maths and physics very much. I am very thankful to both of them. I want to thank Anita ma’am,Diyva ma’am and Anand sir for making all my concepts clear in science and maths . Anitha ma’am has helped me a lot in maths and with her help i have scored very well in my exams. Divya ma’am is very good in giving examples . With the help of it i can understand all concepts easily. Anand sir helps me to understand physics deeply and his facts are awsome . I am really thankful to all the teachers at Byju’s for helping me understand the Subjects well and assisting me whenever I have a doubt.And I love the way they teaches.On the teachers day I want to thank all the teachers to make the tough concepts and terms so easy to understand.I want to say that the teachers at Byju’s are simply great. love to all my teachers who helped me explore the world of knowledge through their interesting & innovative teaching & showing me how fun learning can be. HAPPY TEACHERS DAY.A good teacher is like a candle,it consumes itself light the way for others.all the teachers of byju’s are outstanding.I love physics the most,aanand srinivas sir teaches in an extraordinary way.so,my favourite teacher is Mr.Aanand Srinivas. Anand sir and Divya mam are the best lot of amazing and wonderful teachers I have discovered till date in my 11 yrs of educative life ……..By hearing what they teach…..I totally assure that science is surely the best subject that could ever have been introduced on this Earth…And Obviously a great thank-you to Byju raveendran sir for developing such a great platform for making student’s life much easier , educative , knowledgeable and of course no doubt the interesting​part of a person’s life……..
Divya madam you are just too adorable…you teach so well! I love the way you teach! Vinay sir and Sankar sir you people are two of the best biology teachers I have seen! Ashwin sir and Siddesh sir…you people make Chemistry even easier!! Anand sir and Avinash sir you both keep Physics more interesting…you people are too good at teaching it..! Arjun sir, Byju sir and Anita madam..you make solving maths a enjoyable time! I wish you all a very happy teacher’s day!! All the teachers of byju’s are great and helpful. Aanand sir is best and makes physics easy. Thank you Aanand sir I like your videos very much. Happy teachers day to all my byjus teacher’s and Sirs . I love all the teachers !!!!! Thank you so much for making learning this simple and interesting….. I don’t know how to thank you all….I am out of words…… THANK YOU SO MUCH……. Joining Byju’s was the best decision I ever took. Happy Teachers Day to Mr. Aanand Srinivas Sir. He made learning Maths so easy for me. Divya Maam, Vinay Sir & Aswin Sir is NO less in making learn / understand. Thanks to Byju”s team for great support !! Happy Teachers Day…to entire team of Byjus…. And all the credits goes to Aanand srinivas sir!! Sir u had brought a lot of change in my life.Now physics and chemistry is easy for me and it’s very interesting. The way you explain is just awesome and I understand evrything whatever u teach. And then my favourite teacher is Divya maam.You teach biology very well and thanks for ur shortcut methods which help me to balance any chemical equation,and remember the hormones in plants(CAGE). I really love the method u use to teach biology. So he made teaches like you. Thank you so much for making the concepts interesting and easy to understand. I wish to all teachers and Byjus team a very happy teachers day. Teachers are the pillars of life. A subject can make a student a master in it. But to become a master you need to have the mindset that the subject is interesting. I feel biology, physics and chemistry very interesting. I owe all of this to my teachers Divya Gokulnath ma’am, Aanand Srinivas sir and Aswin Vijayaraghavan sir. Thank you very much for all of your support and explanation. And a very Happy Teachers Day to all my teachers. Happy teachers day to all the brilliant teachers of byjus’.special greetings to my favourite teachers Anand sir and Divya Mam. you made science really interesting for me! My favourite teacher is Anand sir.He has a good body language.He makes things a lot simpler.He is the best teacher. very Happy Teachers Day to all the teachers at byju’s. although I am little late but I checked out the mail today only.All the teachers at byju’s are really wonderful and all of them teach wonderfully.but the person who is the reason behind me using byju’s is Anand Srinivasan sir. at first when I was the first lecture of my video classes at an instance my interest was generated byju’s classes because of Aanand sir.the way he has taught the concepts of physics.. is awesome.the another teacher who is in my favourite list is Abhishek sir. The way he teaches chemistry make the toughest concepts of chemistry easier for me. I would like to say that difficulty of byju’s the best in the world as per me. 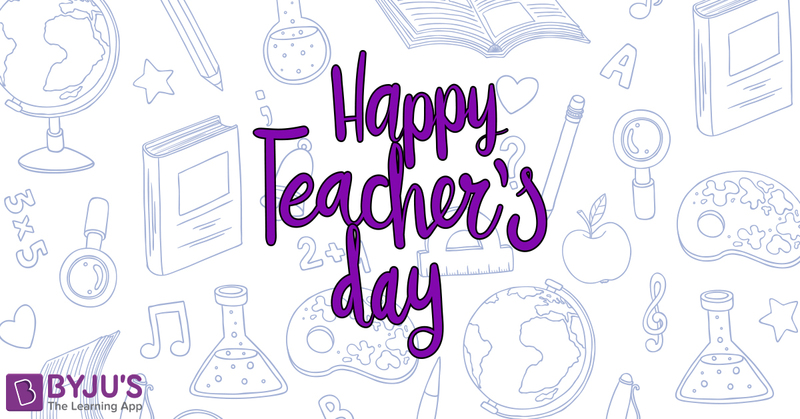 A very Happy Teachers Day to all the teachers at byju’s classes. Yes I am late because I checked out the mail today only. The interest which is generated in me related to my study it’s because of byjus only. The faculty of byjus top class all the teachers here teach in a very interesting way. the man because of whom I am a student of byju’s classes is Aanand Srinivasan sir. The way he has made the concept of Physics sorry… Taught the concepts of Physics …..what to say about that. Watching the videos of Ananand sir I feel that I am watching some movie and that make the concepts for easier me. Another teacher who has generated a lot of interest in my studies is Abhishek sir the ways he has short chemistry is also very interesting. Again a very Happy Teachers Day to all the teachers and mentors of byju’s classes..
All teachers are too good…. Tanay sir and Divya mam are my favourites. All teachers in Byjus help us to understand in the simplest way and make sure that we understand it.I like all the teachers who tech me but I like Divya Techer the most. All teachers are amazing but Aanand sir & Divya ma’am are my favourite teachers they are simply amazing. I really love the way in which Aanand sir teaches. My favourite teacher in byjus is Aanand sir. I love the way he teaches us physics. We could see his passion for teaching while he teaches us. Happy teacher’s day to all….belated wishes. My favourite teacher is Aanand sir. He is my inspiration too. Aanand Srinivas sir is my favourite teacher. He is just outstanding. My belated teacher’s day wishes! Physics is always my favourite subject and Aanand sir just took physics to a whole new level! Thanks to all the teachers who made learning possible in the way I always wanted it to be like!